A federal grand jury in New York has indicted a Saudi native on charges of joining al Qaeda in fighting U.S. forces in Afghanistan and conspiring to bomb U.S. diplomatic facilities in Nigeria. Ibrahim Suleiman Adnan Adam Harun, also known as "Spin Ghul," was extradited from Italy to the United States in October. The six-count indictment accuses him of, among other things, joining al Qaeda after arriving in Afghanistan in 2001, fighting U.S. and coalition troops in Afghanistan in 2002 and 2003, and traveling to Africa "with the intent to conduct attacks on U.S. diplomatic facilities in Nigeria," according to the office of the U.S attorney for the Eastern District of New York. There has been another confirmed case of a mysterious new SARS-like virus. The Saudi health ministry informed the World Health Organization that a 39-year-old man was hospitalized with the novel coronavirus on February 28 and died two days later. 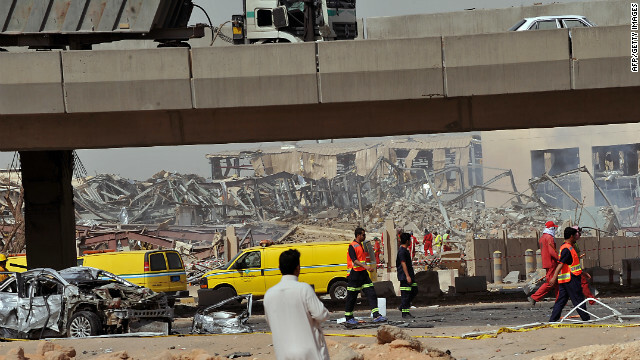 Rescue workers inspect the scene of Thursday's blast in Riyadh, Saudi Arabia. [Updated at 1:51 p.m. ET] A fuel tanker rammed into a bridge and exploded into a ball of fire Thursday, killing 22 people and sending flames sweeping over the Saudi Arabia capital, state television reported. In addition to the fatalities, at least 111 others were wounded, according to the report. Wedding guests fired into the air in a celebration of the happy couple. Soon, 23 people were dead. The shots at the event in Saudi Arabia struck an electrical pole, which then collapsed, sparking a fire, according to state media. Mansour Arbabsiar says he conspired with members of the Iranian military to plot to kill the Saudi ambassador to the U.S.
Manssor Arbabsiar once denied that he participated in a plot to kill the Saudi ambassador to the United States. Now he says he did. Arbabsiar, a 57-year-old Iranian-American man from Texas, pleaded guilty Wednesday to trying to recruit a Mexican drug cartel to bomb a Washington, D.C., restaurant while Saudi Ambassador Adel Al-Jubeir dined there. Arbabsiar, who was arrested in September 2011 after an undercover informant's tip to authorities, said in Manhattan federal court on Wednesday that he conspired with members of the Iranian military in the formulation of the plot. The admission comes nearly a year after he pleaded not guilty. Federal authorities say Arbabsiar and cohorts hired someone they thought was a cartel contact to assassinate the ambassador, but the contact was an undercover government informant who kept in contact with Arbabsiar until there was enough evidence for his arrest, according to federal court documents. Arbabsiar is scheduled to be sentenced in January. Iranian President Mahmoud Ahmadinejad last year dismissed allegations that Iran was connected to the plot. Saudi Arabia will let its female athletes compete in the Olympics for the first time, its embassy in London said. Until now, Saudi Arabia was one of three countries that did not allow women to participate in the games. The other two - Qatar and Brunei - also reversed course this year and said they will send athletes to the London games that begin July 27. "The Kingdom of Saudi Arabia wishes to reaffirm its support for the sublime meanings reflected by Olympic Games and the cherished values of excellence, friendship and respect that they represent," the Saudi embassy in London said in a statement, announcing its decision. The statement added that women who qualify for the games will be allowed to participate. The decision is a rare concession for a kingdom where women are banned from driving. They also cannot vote or hold public office, though that will change in 2015. Women in Saudi Arabia also cannot marry, leave the country, go to school or open bank accounts without permission from a male guardian, who usually is the father or husband. Much of public life is segregated by gender. When it came to sports, female athletes were barred from the Olympic games because they would be participating in front of a mixed-gender crowd. The Saudi embassy did not say what prompted the kingdom to change its mind. Saudi Arabia named Prince Salman bin Abdulaziz to be crown prince Monday, the state news agency reported, putting him next in line to the throne of the oil-rich kingdom. His appointment comes a day after burial services for Crown Prince Nayef bin Abdulaziz, whose death was announced Saturday. Salman, who was already defense minister, retains that post and becomes deputy prime minister as well, the Saudi Press Agency reported Monday, citing a royal order. Nayef, a hard-line conservative credited with pushing back al Qaeda, also served as interior minister. He is being replaced by Prince Ahmed bin Abdulaziz, the Saudi Press Agency said. All family members of Osama bin Laden who had been detained are leaving Pakistan for Saudi Arabia on Thursday night, said an attorney for some of the family members. A judge had ordered earlier this month that the terrorist mastermind's three widows and two daughters be deported after serving their sentence for living illegally in Pakistan. The relatives were in Pakistani custody since U.S. Navy SEALs raided bin Laden's compound in Abbottabad and killed the al Qaeda leader in May 2011. Osama bin Laden's three widows and two daughters could be deported from Pakistan on Wednesday after their period of house detention expired overnight. A Pakistani judge ordered earlier this month that the five women be deported back to their countries of citizenship after serving their sentence for living illegally in Pakistan. The 45-day detention period ended Tuesday night, said Aamir Khalil, the widows' lawyer. But he said he had no information on when they would be deported. The widows - identified by U.S. and Pakistani officials as Amal Ahmed Abdul Fateh, Khairiah Sabar and Siham Sabar - have been in Pakistani custody since U.S. Navy SEALs raided bin Laden's compound in Abbottabad and killed the al Qaeda leader in May 2011. 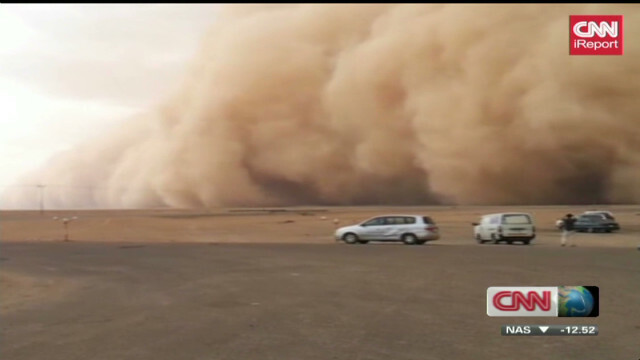 CNN iReporter Mujahid Latif captured images of this storm in Saudi Arabia. Hold on tight as you watch these videos! Photographers had to battle strong sand and dust storms to capture these eye-popping clips. 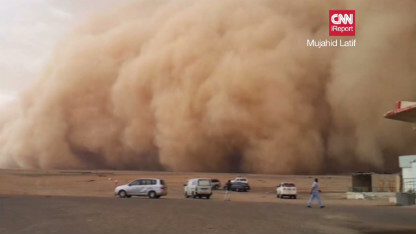 Our first "Gotta Watch" video was captured by iReporter Mujahid Latif as he watched a wall of sand blow through Riyadh, Saudi Arabia. This meteorological phenomenon impacted a wedding in Arizona, too. See how the couple reacted when their wedding ceremony was suddenly covered in dust. And a CNN reporter got a taste of one of these storms while shooting on location in Iraq. See him covered in dust as he tries to report from Camp Adder. You've "Gotta Watch" these videos and more! iReporter Mujahid Latif witnesses a sandstorm outside Riyadh, Saudi Arabia. A sandstorm recently slammed into Saudi Arabia's capital, Riyadh, turning day into night with almost zero visibility. iReporter Mujahid Latif captured images of the weather phenomenon on his camera and shared them with CNN. 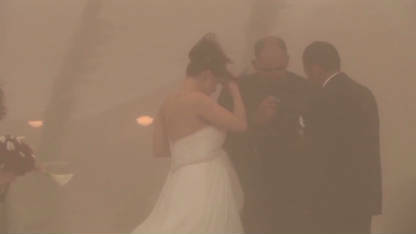 An Arizona wedding ceremony is interrupted when a massive haboob sweeps dust all over the couple and their guests. Gus and Jennifer Luna experienced a memorable wedding day after their outdoor nuptials were crashed by a huge sandstorm in Florence, Ariz., on Sept. 10, 2011. 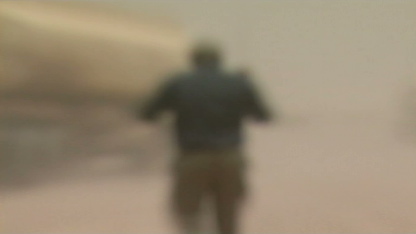 CNN's Fred Pleitgen finds himself in a nasty sandstorm as he shoots for BackStory. Back in 2010, CNN's Fred Pleitgen tried to file a report from Camp Adder, Iraq, about the U.S. troop drawdown. He ended up getting covered in a cloud of sand and dust instead! A dust storm makes its way across Arizona, reducing visibility to almost zero and causing headaches for motorists. 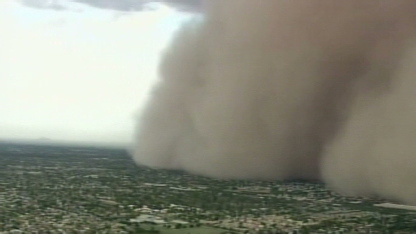 Back in July of last year, CNN affiliate KNXV captured stunning images of a dust storm making its way across Ariziona. An Australian man sentenced to 500 lashes and a year in prison after his conviction on blasphemy charges in Saudi Arabia has been pardoned and is headed home, officials said Thursday. Mansor Almaribe was arrested and convicted in November in the city of Medina. "Saudi Arabian authorities have granted Mr AlMaribe a pardon from his prison sentence, and his corporal punishment was also greatly reduced and administered in a way that did not cause physical harm," the Australian foreign ministry said in a statement. The ministry did not elaborate on how the lashing was carried out. It's unclear what the 45-year-old Shia Muslim from Victoria state said or did to get arrested, but Australia had appealed for leniency after his sentence. Australian officials said they were told Almaribe made comments "insulting to prophet Mohammed's relatives." "I don't think my dad would even survive 50 lashes not 500," his son said last month. "He goes to the doctor every week for checks ups. He has knee injuries and back injuries from a car accident and he also has diabetes and high blood pressure." The family spent weeks searching for the Iraqi-born father of five after he went missing in early November while performing the Hajj pilgrimage in Saudi Arabia. Blasphemy is punishable by up to a death sentence under the strict Muslim law in Saudi Arabia. The family of an Australian man, convicted of blasphemy by a Saudi Arabian court, wonders what it is he could have said that earned him a sentence of 500 lashes and a year in prison. Mansor Almaribe's son said the pair only had a 90-second phone conversation since his arrest last month. "He could not speak freely because authorities were around him but he said the charges are very stupid and 'They charged me for something I have not done," his son, Issam, said. Almaribe was found guilty of blasphemy after he was arrested last month in Medina while on a pilgrimage, Australian officials said. 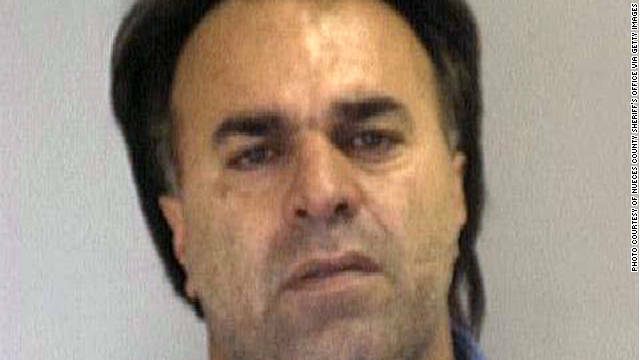 It's unclear what the 45-year-old Shia Muslim from Victoria state said or did to get arrested. "I don't think my dad would even survive 50 lashes not 500," the son said. "He goes to the doctor every week for checks ups. He has knee injuries and back injuries from a car accident and he also has diabetes and high blood pressure." The family spent weeks searching for the Iraqi born father of five after he went missing in early November while performing the Hajj pilgrimage in Saudi Arabia. "When we found out what happened, it was the worst thing I ever pictured in my life," Almaribe said. "My mother cried the whole night and my baby brother cried because he saw my mom crying. It was the worst night ever imaginable." Yemeni President Ali Abdullah Saleh arrived in Riyadh, Saudi Arabia, Wednesday to attend a signing ceremony for a Gulf Cooperation Council proposal aimed at ending Yemen's months-long political crisis, a Yemeni official said. Once Saleh signs the agreement, executive powers will be transferred to Vice President Abdo Rabu Mansour Hadi "effective immediately," Mohammed Albasha, a spokesman for Yemen's embassy in Washington, said in a statement. "This monumental agreement will hopefully bring an end to the 10-month long turmoil in the homeland," Albasha said. Saleh will remain permanently in Saudi Arabia after he signs the deal, a presidential source said. Bahraini authorities discovered "a terror cell" and have arrested five people for allegedly planning attacks against government and diplomatic buildings as well as unidentified individuals, officials said Saturday. The discovery of the alleged plot began when Qatari security authorities arrested four Bahrainis who entered Qatar from neighboring Saudi Arabia, said a Bahrain Ministry of Interior spokesman. The suspects were carrying documents and a laptop "containing sensitive security information and details about some places and vital establishments in Bahrain, as well as airline bookings to Syria," the spokesman's statement said. The suspects were also carrying a "significant" amount of U.S. dollars and Iranian toman, the spokesman said.